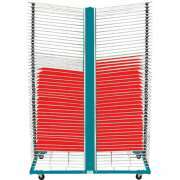 Buy Art Drying Racks For Your Preschool: Shop Now! How can you dry artwork quickly? Art drying racks allow you to dry many projects at the same time. These shelves really come in handy when you have multiple pieces that all need time to air dry. Instead of crowding drawing tables and easels with finished work, use an art storage rack to hold paintings and pictures as they dry. 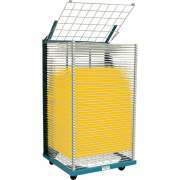 Having a paint drying rack that is ready to use is convenient for any school setting. 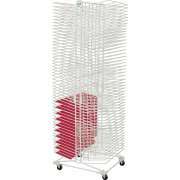 It enables you to accommodate a large number of student art projects while keeping everything organized. This ensures that projects will not get mixed up or damaged while they are drying. Where should I put prints to dry? If you are doing screen printing or making professional posters, having a place where everything can dry without risk of damage is extremely important. Clients are not likely to be impressed by smudged prints. An art drying rack gives each individual print its own place so it can air dry quickly without being damaged. This solution also offers a great way to organize and locate prints. With separate racks for each picture or poster, it&apos;s easier to find the specific one you are looking for. Do I need a drying rack? 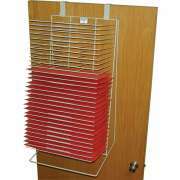 If you are an artist or part of a company that works with any kind of ink or printing, you can probably benefit from an art drying rack. 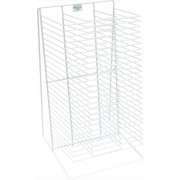 Because individual racks have a few inches of space between them, they can be used for drying just about anything. 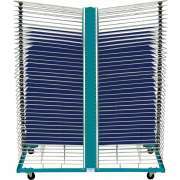 From textiles to photos to prints and beyond, anything that is relatively flat can occupy a space on a drying rack. If your company does screen printing, poster making or fine art, you should definitely think about getting one of these. 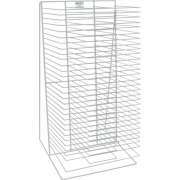 Drying racks make your space look professional, organized and neat. What is the best way to organize student artwork? Many schools have art rooms that are frequented by multiple classes over the course of the day. With so many students doing projects, an art room can easily become crowded with paintings. An art drying rack enables each piece to get the right ventilation without taking over every available surface in the room. It gives students an appropriate place to keep their work so they will know exactly where it is when they want to come and pick it up. How can you prevent artwork from getting damaged? When pictures are stored in a place that is specially designed for this purpose, they are less likely to become damaged. However, when they are left out in the open, spills and other accidents are much more likely to occur. By providing an individual space for each work, you also ensure that similar projects won&apos;t get mixed up. 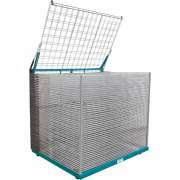 Drying racks are designed with enough space in between each shelf to allow for quick drying, and prevent projects from getting stuck or damaging each other. Separate shelves make it easier to stay organized. The art teacher can designate certain art drying racks for particular classes or grades. Many of our options have such a high capacity of individual spaces, that you might even be able to provide each student with a personalized space. Need a great way to transport projects from the art room to your students&apos; homeroom? 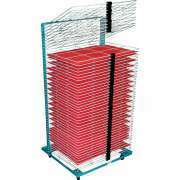 Portable art storage racks make it easy to move multiple projects without risking any damage. We offer a number of models on wheels that can simply be rolled from one location to another. This is also convenient because when you need to make space in one room, you can easily roll projects to a new location. 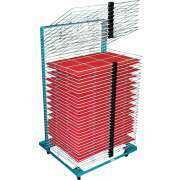 Are there different kinds of drying racks? Art drying racks come with different amounts of space between the shelves. If you want to store thicker materials, you should consider a model with 3” between shelves. In addition to housing school projects, they are also convenient for a company that needs to store presentation boards for a conference or seminar. With more space between each shelf it is also easier to see which paintings are where so works can be retrieved quickly. 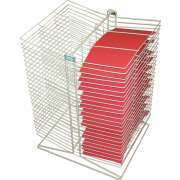 Where can I put drying racks? Art storage racks come in a number of different configurations. Tabletop drying racks fit well either on the floor or on a table or counter. If you are looking to save floor and counter space, you can try a hanging rack, which easily fits on a wall or the back of the door. 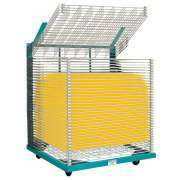 Kids&apos; paint drying racks offer an excellent alternative to the classic rack design. They feature hanging strings which you can clip paintings onto with the use of clothespins. Wooden drying racks fit in with classroom decor. They will make a great addition to a preschool art center. Any classroom or studio can benefit from the use of an art drying rack. 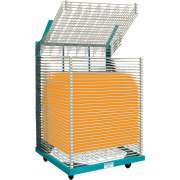 This handy piece of equipment can fit in a number of different places for convenient transport and storage. If you are looking for a great way to keep projects organized while they dry and protect them from damage, art storage racks are a great choice.